Description of "Acme International Research Journal (August - 2014) "
Acme International Journal of Multidisciplinary Research is a monthly international multidisciplinary peer-reviewed research journal. It covers all disciplines including Arts, Science, Commerce, Social-Sciences, Engineering. The Languages of Research Paper are English, Hindi, Sanskrit & Gujarati. It is published every month. Researchers are honored with Certificate for their research paper. This journal functions as an excellent online research paper which focuses on discourse in academics discipline. The scope of articles for our journals includes case studies, theoretical and empirically based research. All manuscript shall be peer reviewed and selection shall be based on the strength of quality, originality and contribution to knowledge. 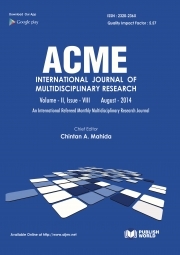 Reviews of "Acme International Research Journal (August - 2014) "